Established in 1853 and purchased by the Bourke family in 1920, this renowned hotel has retained its Irish integrity and character. Take pleasure in a good yarn with a local over a smooth Guinness on tap, enjoy live music, or dine in the hotel's unique home-style restaurant, in which Irish favourites are a feature. Bed and breakfast accommodation is also available to experience the charm of the hotel. Koroit Hotel was Established in 1853 by David McLaws a Scottish carpenter and pioneer. McLaws built a two-storey bluestone hotel with large stables erected at the rear and in 1869, an assembly room was added to be used for concerts, dances, lectures, auctions and other public meetings. In 1877, he sold the land and buildings to Robert Bruce, a local State Parliamentarian. Bruce altered the exterior of the hotel by rendering the bluestone walls with plaster and rough cast. In the early part of the 20th century, the subsequent owner, J.F.Duffus, also a State Parliamentarian, commissioned a leading architect to remodel the exterior as a spectacular elaborate Art Noveau styled hotel, known as the "Menzies of the Bush." Upon Duffus' death in 1922 the hotel was sold to Edmund (Neddy) Bourke. The hotel earned an outstanding reputation under the management of Michael Bourke, the son of Edmund, and owned by the Bourke family from 1922 to 2000. The hotel has always been a popular venue for Irish music and draws a grand crowd for St Patrick's Day celebrations. The fifth owners of the hotel, in its 150 years, Bruce and Wendy Murley have brought the hotel back to life again being the centre of the annual Lake School of Celtic Song, Music and Dance, Koroit Irish Festival and links with the Port Fairy Folk Festival. 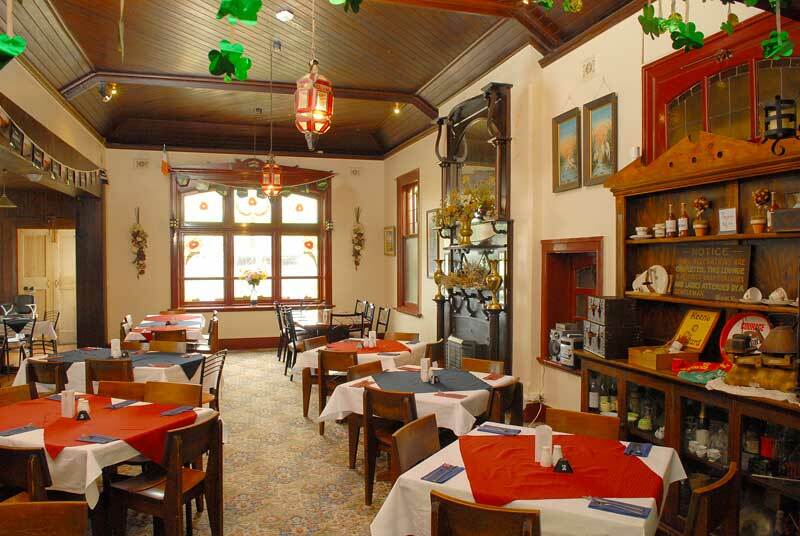 The hotel has strong hsitory ties with the town's Irish heritage an icon and meeting place for the community of Koroit. Contact us for upcoming gigs on 5565 8201. Take pleasure in a good yarn with a local over a smooth Guinness on tap and enjoy live music on Fridays. Mickey Bourkes is open 7 days and features our special blackboard menu. Come and enjoy a relaxed pub meal or catch up with mates over a pint or two. Pleasant Sunday Visit - This is a classic local country pub, we visited on a cold Sunday afternoon for drinks and were made very welcome by the owner and her staff. As the previous day had been the Irish Festival in the town there was plenty of stories from the locals of the day's activities and happenings. Although we did not have meal here they looked and smelt delicious, we plan to return next year to attend the Festival on the Saturday and will definitely eat her. Irish Festival - Only called in for the bands and on-tap Guiness during the Irish Festival weekend. Place was packed, and everyone having plenty of fun. Restaurant area full but place really buzzing. Despite that staff quick and freindly with service. Great value - At just A$80 for a double room including a 4 poster bed and continental breakfast this is tremendous value for money. Looks like the shared bathrooms/toilets/showers have recently been rennovated to a high standard. Nice friendly bar to drink in and very good food indeed.